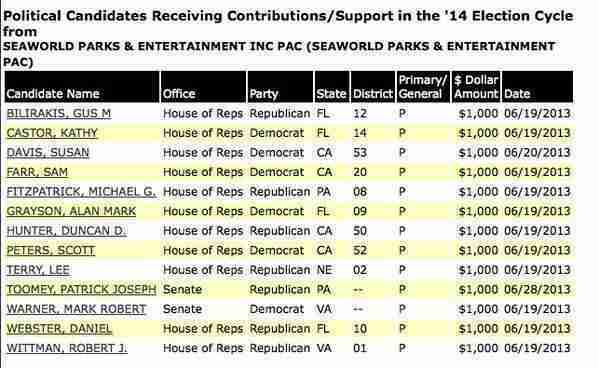 Seaworld "will not back down" from paying politicians. Seaworld "will not back down" from paying politicians to listen to more lies. Today's article in World Leisure was misleading. "We have no intention of allowing anyone to close ALL zoos and aquariums." This was said by the SeaWorld President John Reilly who was speaking to political leaders and businessmen at the South County Economic Development Council‘s 24th annual economic summit in San Diego on 10 October. Actually, activists don't want ALL aquariums to close, Mr. Reilly. If Seaworld played its cards right, their parks wouldn't have to close either. They would only have to stop holding cetaceans in captivity and move onto more modern forms of entertainment, like the ones proven below. There are many aquariums supported by the anti-captivity movement and marine biologists from around the world. Monterey Bay Aquarium, one of the most successful aquariums in the country, who has been the exceptional leader for three decades of aquaria. Almost 2 million people visited this educational center last year and they don't have to hold cetaceans captive, on the contrary, this non-profit aquarium is thriving. They use the natural environment of active marine life outside the aquarium to educate and inspire future conservationists, not future "exploitists", as Seaworld does with promoting the false idea that captivity is for "their own good". The Aquarium has established a long standing funding philosophy to assure that earned revenues cover core Aquarium operations each year. Overall, the 2014 budget calls for $85.5 million in total spending, consisting of $63.4 million in expenses and $22 million in capital expenditures. 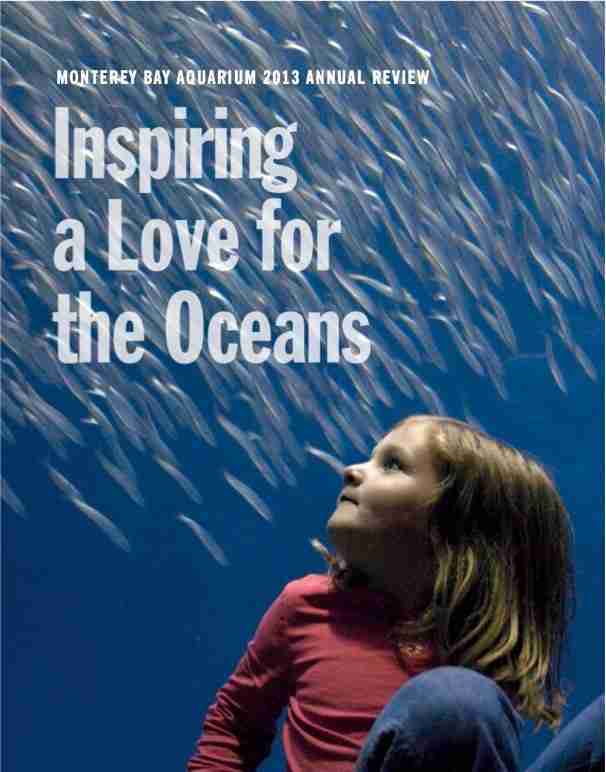 In 2014 the Aquarium purchased a 23,000 square foot building on Cannery Row to build a new Education Center. The project cost to develop the Education Center is approximately $25 million. The new Education Center will expand programs for teachers and youth, provide more facilitated programs for school groups that visit the Aquarium, and integrate technology to reinforce lessons learned at the Aquarium. The Aquarium has also embarked on a $150 million Campaign which will run through 2018. The Campaign is designed to fund exhibit and program initiatives outlined in the Aquarium's strategic plan. It will also raise funds toward a growing endowment. Sounds like Monterey Bay is on the right track, and thus have the support of millions around the world, including activists. Activists don't want to close down the National Aquarium in Baltimore either. This non-profit maverick educates the public with cool entertainment that kids love like dynamic 4-D sensory immersion movies and more. Watching kids' brains light up as they learn about both prehistoric and current sea creatures in 4D is a modern way of educating the public about marine life. Watching barely-living drugged-up captive whales repeat the same tricks does the exact opposite; it de-educates the masses. National Aquarium decided to stop their dolphin programs and are looking for a sanctuary to retire the 8 dolphins that currently live there. "Thrusting itself to the forefront of a debate about keeping dolphins and whales in captivity, the National Aquarium in Baltimore, Maryland, has announced that it is considering retiring its eight bottlenose dolphins and moving them to an oceanside sanctuary. The proposed move comes at a time when the aquarium is shifting its overall mission from being mainly a tourist attraction to becoming a major conservation organization with national recognition. Although the final decision about the dolphins has yet to be made, John Racanelli, the National Aquarium's director, said in a press statement, "we are studying and evaluating all possible options for providing them with the best possible living environment in the years ahead." The aquarium has already hired Studio Gang Architects from Chicago to explore preliminary designs and has discussed the overall plan with several dolphin and whale biologists. And the news-even if not final-is being widely celebrated. "I applaud them for considering ALL options, including the idea of retiring the animals to a sea pen," Naomi Rose, a cetacean biologist with the Animal Welfare Institute, wrote in an email to National Geographic." Reilly contended that the "wild is a threatened place". Sea World, Busch Gardens recently awards $1 million in grants for conservation projects. 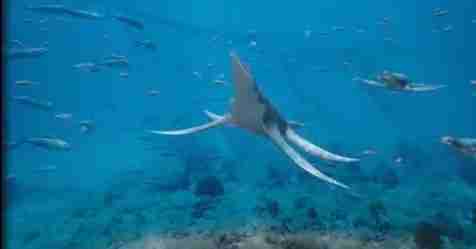 None of them effect any marine life in those "threatened places" mentioned by Reilly. So, who is Seaworld misrepresenting activists to this time? The ones that are voted in by the public. Really, Congressman? I wonder how your voters will feel about this when they pass your name on the roster. 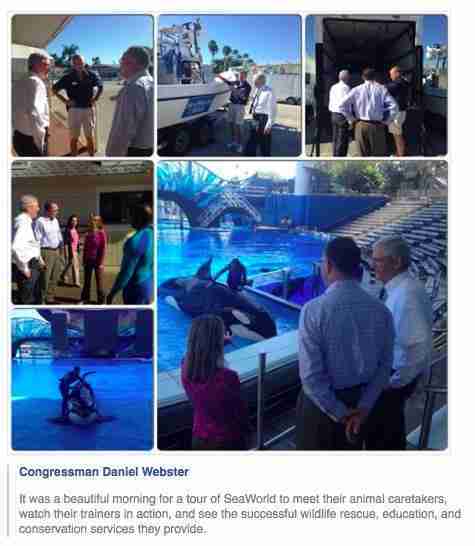 Seaworld recently hired a powerful energy lobbyists to "persuade" politicians to see things their way in regards to local and federal laws (like AB-2140 the Blackfish Bill). No doubt the contribution list will grow this year, make sure you know before voting. Register to vote, and make certain an educated choice is cast this election season.